Whilst I have reblogged this article from another blog, and I do agree that John Key has been a disaster for this country, it does not mean I or 1Law4All agree with every statement made in the article. For example, I don’t believe we have true poverty in New Zealand. If you calculate the number of people living in poverty as the number living on a percentage of the average wage, then we will always have poverty, even if that same percentage are on an income of $100,000.00 a year. It’s a ridiculous way to decide if people are living in poverty. I also know that by always stating the number of kids, rather than the number of people, is designed to tug at the heart strings, (or guilt strings), because most of us know that if kids are living in poverty, it’s their parents fault. Not the Governments or the taxpayers. The last few in green I’ve added. I’m sure you can think of many more. Let’s hear them in the comments! Interesting comments, some of which I agree with and some I don’t. Certainly agree with Key and Findlayson pandering to the Maoris though. So who would you suggest voting for? Labour will be even worse! I went through the questions on http://www.onthefence.co.nz and it gave me ACT, NZ First and lastly, National. So far NZ First are the only ones talking about 1 law for all. 1Law4All will not tell anyone how to vote. But I can tell you that, even though it’s a risk that NZ First may not follow through with their promises, I personally will be voting for them. My hope is that if large numbers of people vote for them because of their 1 law for all policies, even if they don’t follow through, it should send a message to other parties that this is an important issue that does matter to a large number of people. What makes you think NZ First may not follow through on these undertakings? I don’t think for sure that he won’t. He may very well follow through. However, he’s a politician making promises in an election year. Call me cynical but that says it all really. Let’s just say I’m hoping for the best, but won’t be surprised if we get the worst. I hope he does follow through because we’ve recently gotten to know Clayton Mitchell a little bit, and you couldn’t wish for a nicer, more sincere man. It’s due to him, and his assurances, that I’ll be voting for NZ First this year. For your promise to abolish Maori seats in parliament – Yeah, right! yes, that’s a huge one! Given time he will be recognised for what he was – one of the worst prime ministers this country has ever had! I hope so, I really do! Where are the “left’s” criticisms of the last three rants on this list? I’ve not seen any policies or statements from Labour or the Greens that are pitching a reversal of the “pandering to Maori demands ……” and the “championing of racist policies which have destroyed New Zealand’s democracy”, or a call for a binding referendum on the retention or abolition of the Maori Seats in Parliament except from New Zealand First. There has been no mention yet about the Marine and Coastal Act put in by National Party Where Maori can declare wahi tapu on this site where anyone walking a dog,anglers, boaties,surfers and other beaches not part of the tribal group can be fined up tp $5,000 for each trespass. or build without tribal permission to build mooring buoys etc you can be imprisoned up to two years or fined $300,000 where 90% goes to Maori and 10% goes to the crown. The comment about creating 250,000 children in poverty is simply crap-you do your cause no good at all with such rubbish. I totally agree that John key is just the latest in a long line of useless racist traitors who desereve to be put against a wall. Despite Finlayson never getting elected ( failed 4 times I think) and sneaking in the back door on the ‘list’ and having been an employee of the racist maori elite, Key gave him the job of treaty minister which is so ridiculous it was unbelievable. Key knew very well that the public were never consulted or informed about this undemocratic treachery. 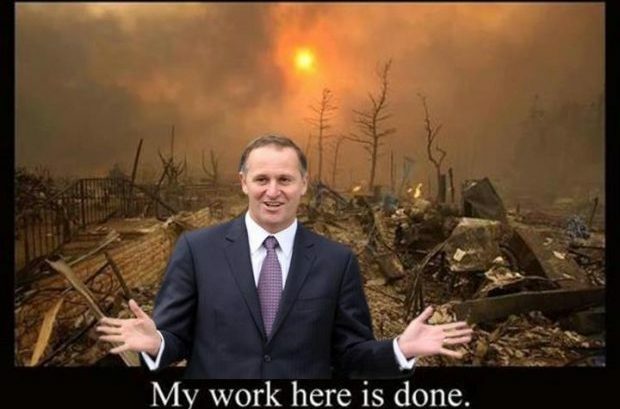 Key spent $26 million on his flagging (excuse the pun) ego when it was needed elsewhere and tried to manipulate the referendum by doing it backwards. An evil anti democrtatic scumbag who became liked by the gullible media because he smiled and gave interviews. This web site is entitled 1law4all and I fail to see how 97% of the leftist rant entitled “Arise Sir John” has anything to do with the important issue of the reverse racism that has developed in this country. In fact in the original list (in grey text) none of the gripes listed had any mention of 1law4all concerns. I think that political views that are completely off topic should be addressed elsewhere and that articles such as this one should be submitted to a known site moderator for consideration before being posted for comment here. There is no such thing as “reverse racism”. Racism is just racism, irrespective of its direction.